Question No. 1: What factor(s) create the tipping point for admission to a highly selective liberal arts school? I hear stories of high act score, top grades, well rounded activities and a big fat NO to admission. Is the essay the key? A student’s grade point average. The strength of the applicant’s coursework in the context of what is offered at his/her high school. An admission representative that I talked to from Occidental College (I misplaced her card) echoed what others told me: The context is important because a highly selective school is not going to penalize a student who hasn’t taken AP classes because they aren’t offered at the high school. It’s the same story for students who attend high schools where there are few AP classes available. Beyond those two biggies, schools will vary on the importance they place on other admission factors. Standardized test scores usually come in third. Finally, students should keep in mind that highly elite liberal arts colleges and universities reject most students — even those who possess excellent academic profiles. That’s why it’s critical to cast a wide net instead of fishing exclusively in the same pond that other extremely accomplished students favor. Believe it or not, there are more than two or three dozen colleges and universities worth applying to in this country! Question No. 2: What are some of the biggest trends college admissions reps noted this year? A major trend this year was students waiting until the very last minute to place their deposit. Tom Willoughby, the vice chancellor of enrollment at the University of Denver, told me that a large number of students waited until the last minute to submit their deposits. Willoughby said that based on his discussion with officials at other schools, the same thing was happening elsewhere. What admission officials hate is what the industry calls “summer melt.” At many schools students had to submit their deposits by May 1, but that won’t stop some families from bailing on their commitment during the summer. I definitely don’t recommend or condone this, but some families are submitting more than one deposit to keep their options open. This is not fair to the schools nor to students who might have gotten an acceptance or been plucked from a wait list if accepted students were honest. Question No. 3: Do schools stating that they are standardized test optional really weigh those candidates evenly in offering merit aid when compared with students submitting these test results? What is the risk either way if grades are over 4.0 and standardized tests only in the 75-80 percentile? Thanks for all the fabulous info you provide! First a definition. Test-optional colleges and universities will allow students to apply even if they do not submit their standardized test scores. This can be a great way to get into some excellent schools for teenagers who haven’t fared well on the SAT and/or ACT. To decide whether to submit scores, I’d suggest that you look at what the SAT/ACT range is at a particular school. If the student’s score is in the top 25% of the teenagers applying to the school, I’d see no reason sit on the scores. You could also ask an admission staffer at a school for advice. You might be surprised by how many students take advantage of the test-optional route. At Pitzer College, for instance, about 50% of students don’t submit their test scores! About a third of all accredited bachelor-degree granting institutions (roughly 850 schools) are test optional. That is somewhat misleading since many of those schools are not selective and have lower admission requirements. More than a third of the top 100 liberal arts colleges, however, are test optional. They include schools like Mount Holyoke, Pitzer (only one on the West Coast), Bard, Dickinson, Lawrence, Furman, Gettysburg, Franklin & Marshall and Bates. FYI, I have never run across a test-optional school that says that its need-based financial-aid awards are impacted by whether teens submit their SAT or ACT scores. If schools do, they aren’t going to admit it. I surveyed about three dozen liberal arts colleges in 2009 for a New York Times article that I wrote on this subject and the majority of them also did not penalize students seeking merit scholarships who did not submit their test scores. The students in this category would be wealthy students who would not qualify for need-based help. Some of these schools required a test-score submission to qualify for merit scholarships while others only made this requirement for their top merit award. The SAT/ACT chapter in new edition of The College Solution explains in greater detail how colleges treat test-optional applications. 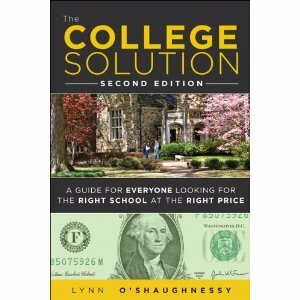 Lynn O’Shaughnessy is the author of the second edition of The College Solution: A Guide for Everyone Looking for the Right School at the Right Price, which was released a week ago. I know this may sound a bit *stupid* for some people but this is really confusing me. I’m about to take my placement test soon for a community college and there’s three different kinds of maths. Beginning Algebra (Algebra I), Intermediate Algebra (Algebra II), & Pre-Calculus. Now, I’m not sure if I have to take all of them or not. Help please! I seriously doubt that you would take all of the placement tests. I would contact the community college and ask. Lewis and Clark in Portland, while not as selective as Pitzer, is another West Coast liberal arts school that has a testing optional program. Oops! You are so right Laura. I should have known better. Lynn, Goucher College is test optional but requires test scores for merit scholarship consideration. Add Wake Forest University to your list of top test optional schools. Yes Wake Forest is test-optional and it made a big splash went it made that move because unlike liberal arts colleges, few highly selective universities have gone this route.